Looking for a fun spin on steak appetizers? Try these bite-size Grilled Flank Steak Pinwheel pops for your next party with a variety of dipping options. Prep the flank steak by chilling it in the freezer for 20 minutes. Remove it and on a clean work surface, slice the steak in half, and then butterfly each half open until completely sliced through. Pound the meat to ¼” thickness. In a resealable bag or coverable dish, marinate the steak in the Lawry’s Honey Bourbon marinade for 4 hours. When ready to prep, drain the meat from the marinade and discard. On a clean work surface, arrange each of the slices of meat out. Layer with the cheese, roasted red peppers and spinach. Wrap tightly in on itself. Chill for another 20 minutes to making slicing easier before slicing into 1” pieces and securing with 2 bamboo skewers, no more than 3 per set of skewers with a ½” room between each for air circulation while cooking. Pre-heat your grill for indirect heat by piling your charcoal to one side. Clean and oil your grill grates. Cover the grill and allow to pre-heat for 5 to 10 minutes. Grill the flank steak pops, rotating as needed with a careful eye. As the cheese melts, it can cause flare ups so it is best not to leave these without someone standing by. Cover and cook 3 minutes per side. Meanwhile, make the Roasted Pepper Aioli. Combine the mayo, minced red peppers, garlic, Grill Mates Chipotle Seasoning Blend, lemon juice and a pinch of salt and pepper in your food processor. Pulse until smooth. The aioli can be made up to three days ahead and stored in an air-tight container in the refrigerator. 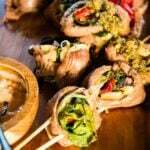 Serve the grilled flank steak pinwheel pops with the roasted red pepper aioli for dipper and garnish with fresh pesto sauce.